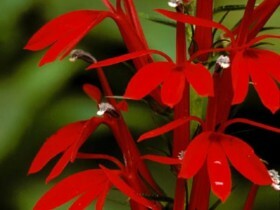 Lobelia – popular varieties, reproduction from seed, growing, care, photo and video. 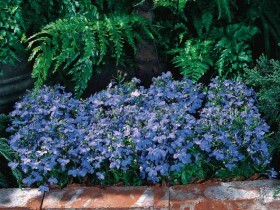 Land, planted with Lobelia, reminiscent of lush mats, who often play the role of ground cover planting. Plant long blooming: from the first days of summer and before the autumn frosts it is covered with small flowers of delicate shades,: pink, blue, purple, sky blue, purple. Growing Lobelia is not a simple process, culture whimsical, requires a lot of worries. In nature this plant is perennial. The conditions of Central Russia does not allow him to spend the winter, garden beauty is grown, as an annual. Lobelia looks good as a border of a walkway or path, highlights the contour of a pond or flower garden, looks interesting in the pot and stony hill. Beautiful flower in hanging basket. 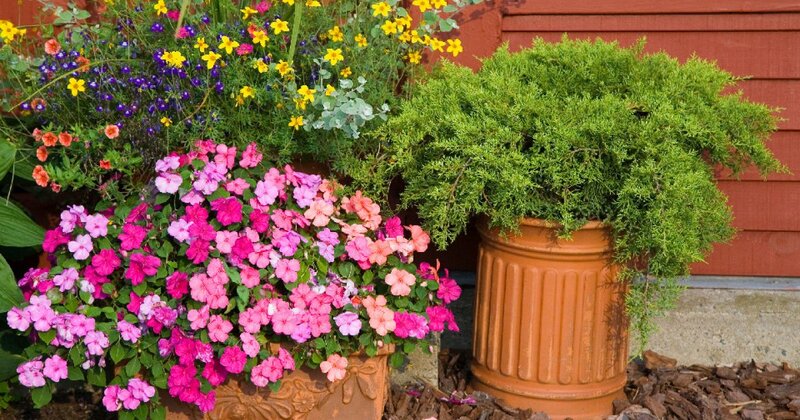 Plant-partners: Impatiens, Petunia, carnation, rudbeckia, verbena, Salvia, pelargonium. With the onset of fall flower, you can dig up, put in indoor pot and leave for the winter in the greenhouse, and next year planted in the open ground. 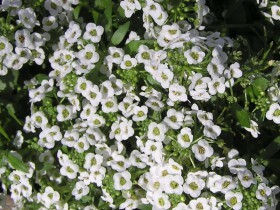 In the cold season, the plant develops poorly, but summer is sure to bloom profusely. climbing (hanging, the cascade shoots to 50 cm in length). 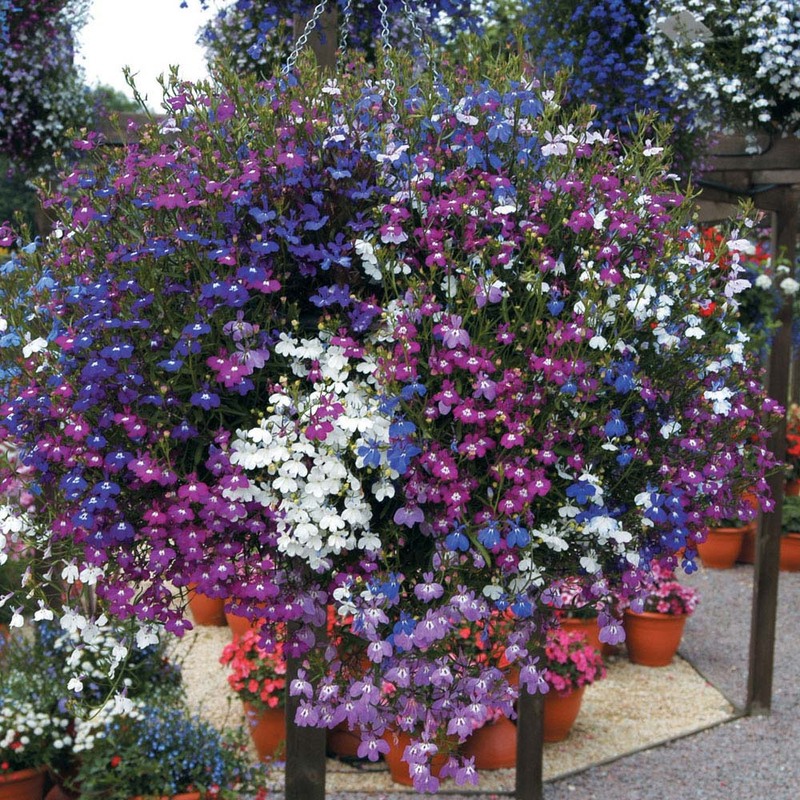 Varieties of Lobelia, grouped by color of flowers. Blue: "Cambridge", Sapphire, Niagara, "Blue crystal", "Beads", "Nostalgia", "Blue breeze". Blue: "Emperor Willie", "Blue cascade", "Cozy corner", "The crystal Palace". Lilac: "The Lacemaker", "Miss Libran", Margo. Red: "Marquis", "Red fountain", "Red cascade". Pink: "Riviera rose", Rosamunde, "Crimson ring", "Pink cascade". White: "Snowball", "Minx", "Riviera white", "Nicole", "White fountain", "White cascade", "White lady"..
Multicolor: "The Viennese waltz", "Merry notes", "String of pearls", "Serpentine". Sandy loam or loamy soil, loose and light soil. The plant does not require excessive richness of the soil. Accommodation in the sun, a well-lit area. 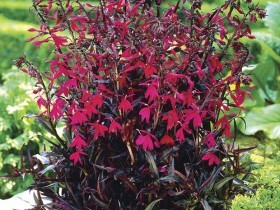 Lobelia likes moisture, regular watering is the key to the normal development and lush flowering. Mowing or topping seedlings, timely pruning Mature plants. Lobelia in the garden. Original flowerbed. Sowing Lobelia start from the end of February or in March. Experienced growers practice winter planting, in December or January. Such a method is possible in the presence of the room with additional lighting, if not, the seedlings will stretch and will be slow to develop. Lobelia, planted in the spring, less affected blackleg and more viable. The seeds of the plants are very small, pulverized, for planting, they are often mixed with sand. Primer you can buy in a specialty store or to prepare in the fall. The best part: sod garden soil, compost, river sand and peat. To normalize the acidity of the substrate can add lime or dolomite flour. The sale is in the form of pellets seeds plants, they are easy to plant in peat tapes and tablets. Fill the container substrate prepared by the land, a little compacted, pour, let stand during the day. The best form of tray – narrow and shallow, necessarily the presence of drainage holes. The water for the first watering, you can add a fungicide. The seeds of Lobelia to put on a piece of paper, bent corner, tapping on it, pour them into the prepared soil, distributing on the surface uniformly. Fit not sprinkle the ground, it should be sprinkled with a weak solution of potassium permanganate, to use a spray. The tray of seedlings cover glass and put in warm. Substrate for seeding can be prepared from a mixture of vermiculite and garden soil. Vermiculite will increase the porosity and the porosity of the soil, normalizes humidity, will protect the roots from temperature fluctuations, neutralize increased acidity. 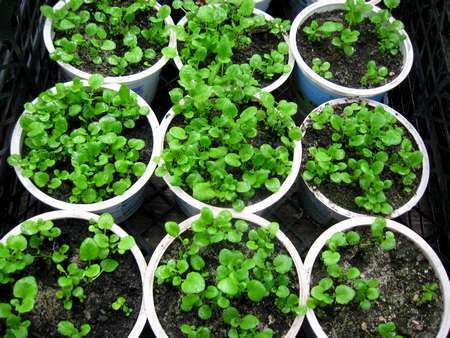 Seedlings of Lobelia, it is recommended to ventilate daily: remove the glass, wipe off the condensation. A week and a half will see the first sprouts. Glass can be removed, place the tray of seedlings in a transparent plastic bag, well tie it to put in the Sunny place, but not direct rays. "The hothouse" is necessary every day to ventilate, to shake off the drops of water and re-wrap the container with planting. To avoid stretching, day plants it is recommended to move the loggia, or enclosed balcony with a low temperature and sufficient light. On the night of the seedlings to bring them in, to provide additional lighting in the evening, and also in rainy and cloudy period. 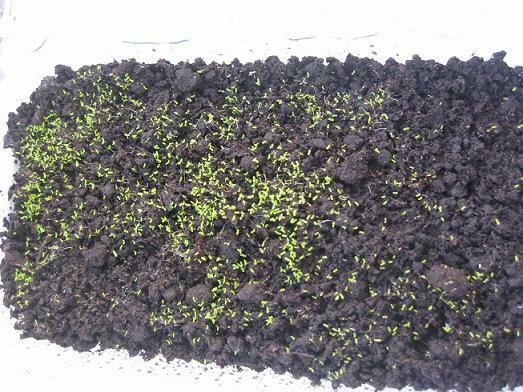 Temperature germination – up to +25 degrees. Moisten planting is best from below, pouring water in the pan. This method will help to avoid mold and rotting of seedlings. It is possible to make watering and traditionally, top, but it should be done carefully, not from a watering can, and a teaspoon or syringe. If the mold is still there – it needs to be remove and sprinkle the soil with a layer of crushed activated charcoal from the pharmacy or calcined sand. The soil should be loose and moderately dry. 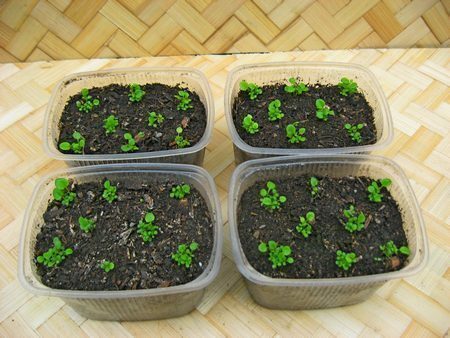 A little grown seedlings of Lobelia are seated in small groups, they grab a spoon for the coffee, ground and transferred into a separate container. Before the procedure, the soil in the tray, be sure to moisturize. Between groups of plants is supposed to be the interval in 2 – 3 cm, the soil is a bit compacted by hand and watered. 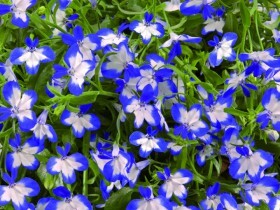 After picking Lobelia grows quickly, to achieve the grass height in 3 cm, they recommended to cut. In the future, plants will begin to custimise. 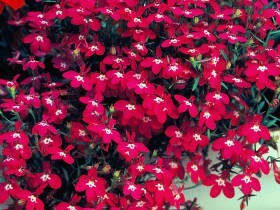 In the open ground Lobelia are planted in early June, the distance between the bushes – 10-15 cm. The best place in the garden – Sunny or penumbral the site with moist soil. Fit to make in the same way, performed as dive – plants to capture small groups through the construction of a spatula or small blade. 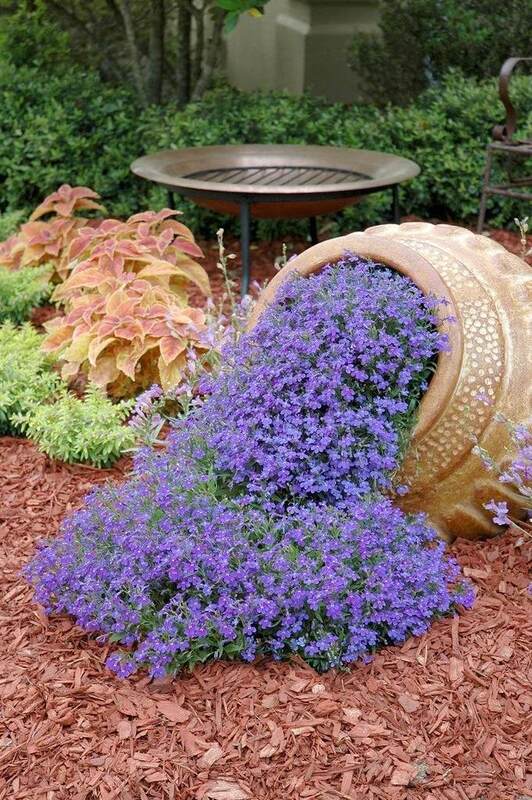 Overly fertile soil is not suitable for Lobelia – it increases the green mass, and bloom poorly. In the middle of summer the bushes can be cut to a height of 5 cm. Simple technique contributes to the growth and a new wave of flowering. Plants can feed: once a week to water with dissolved mineral fertilizers. When planting plants on the ridges or flowerbed need to make the right color decision. Flower beds with delicate tints are formed of colors of related hues: from blue to purple and from white to pink and lilac. Interesting contrast combinations: yellow and blue, red and blue, white and crimson. Red Lobelia looks great next to the orange calendula flowers and variegated Yucca. Blue flowers harmoniously with emerald-purple creeping Ajuga, tuey, red geraniums, silvery wormwood. 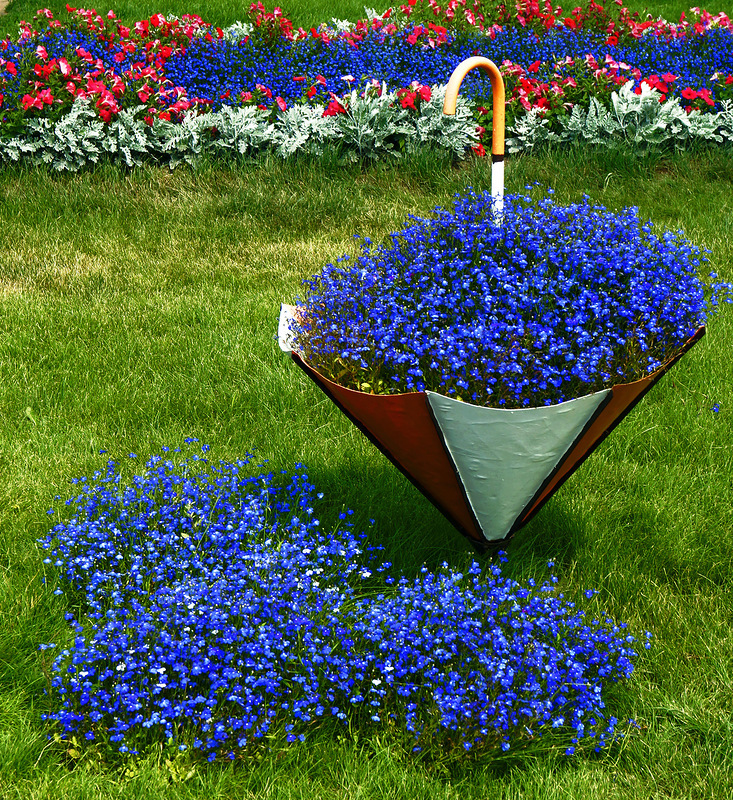 You can make a bed of Lobelia, repucci, pansies and Edelweiss. Another contrasting option: upright shrub with red flowers and yellow stars rudbeckia. Ampelnye plants look very impressive in hanging baskets. With the help of this technique, you can form a solid carpet of flowers, which completely conceal the not very aesthetic frame of twigs or wire. The simplest and original version of the landing in coconut liners with holes. They are filled with potting compost, and the plants are placed on the outside of the basket. As a liner is often used sphagnum, pre-soaked and pressed. They lay the basket on the inside, cover the soil with peat and long-lived fertilizers. At the top of the basket can be planted erect types, in a circle – hanging, basket varieties. Such landing can be made from different plants: Lobelia and petunias, with Lobelia Phlox, ivy, geraniums. A basket of Lobelia in the basket. The third option – decorative vases. Important correct layout of crops and varieties of different heights, leafy texture, size of flowers and inflorescences. It is best to use containers of large diameter, supplied with pedestal. 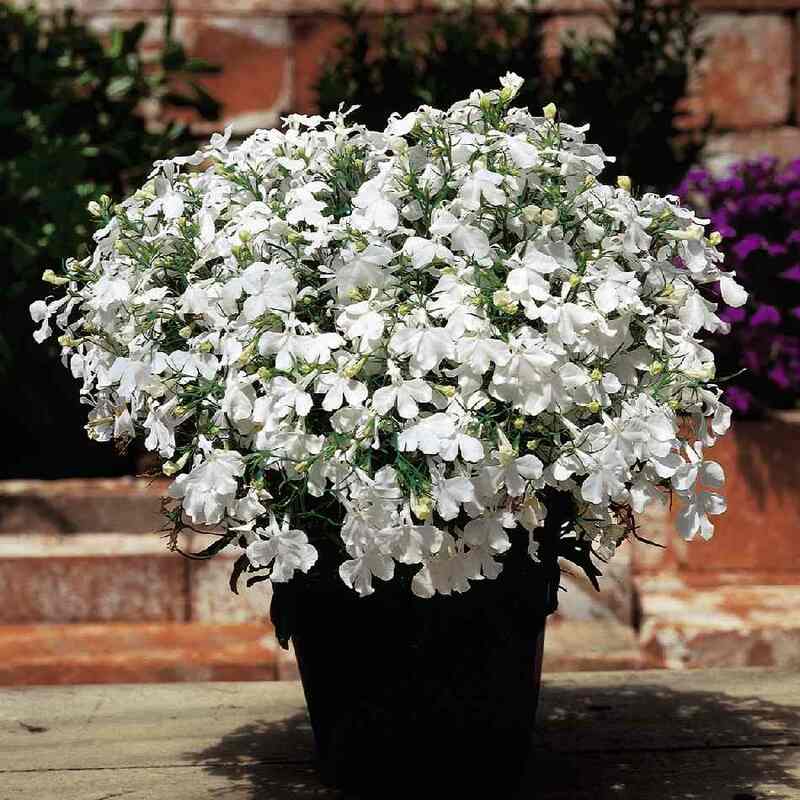 Can be planted together the different Lobelia varieties or dilute it with Petunia, pelargonium, ivy. Looks very original high vase, in the bowl itself you can plant basket plant, and at the foot – compact variety. The pinnacle of landscape design is the so-called "bookcase" from the flower pots of different diameters. Capacity strung on a durable recessed valve, fill soil substrate, the plants are planted and watered. 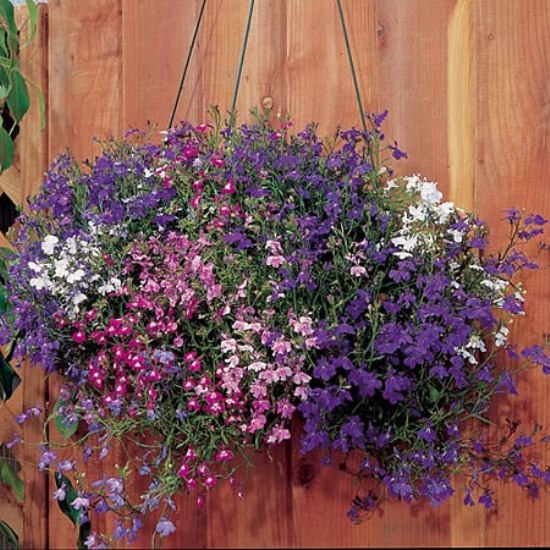 This option of vertical gardening looks good, if there is a mix of Lobelia and balsams, petunias of different shades. The plant can root fungal diseases, such, like rust, mealy and logomachist Rosa, Fusarium, rot. To bacterial include mosaic, jaundice, wilting of the tops. Under indoor cultivation at the first sign of the disease the plants should be isolated, to carry out the treatment with preparations of colloidal sulfur or fungicides. If Lobelia growing in the open ground, the damaged part need to quickly gather and burn. In the case of mosaic-like mottling it is better to destroy the whole plant, while not sick other. After treatment, hands and equipment disinfected. Compliance with all agronomic practices will allow you to grow healthy and beautiful flowers, which will delight the eye all summer. Lobelia varieties “Riviera sky blue”. All content on this site SamDizajner.ru written specifically for Simdesigner, copying 1 in 1 strictly prohibited. 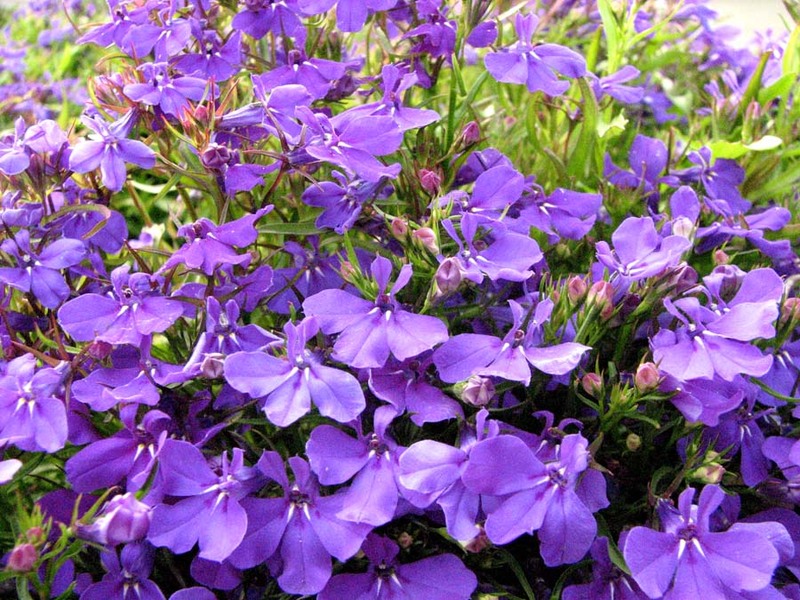 Reprint, full or partial rewriting of the article “Lobelia – delicate charm to the garden landscape”, possible, only when you specify the full, active link to the source.